SMT1110 8mm SMT Cover Tape Extender with 5mm x 500mm dimension. SMT Cover Tape Extender applicable to Siemens, Panasonic, Sanyo, Samsung, Hitachi, Universal, Juki, Fuji and Sony machines. Various sizes cover Tape Extender for SMT are available for different sizes of cover tapes. Customized to decrease unwanted waste of components in production line. Available in 500 pieces per box with 3 color options. Looking for ideal 8mm SMT Cover Tape Extender Manufacturer & supplier ? We have a wide selection at great prices to help you get creative. All the SMT Cover Tape Joint are quality guaranteed. 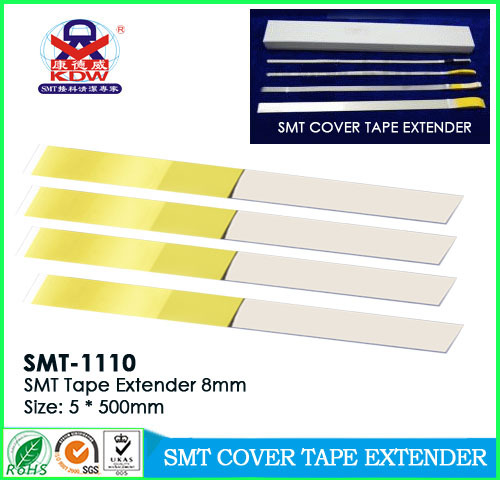 We are China Origin Factory of Cover Tape Extender for SMT. If you have any question, please feel free to contact us.